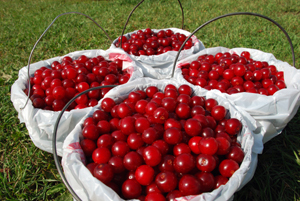 Cherry harvest is soon beginning in Door County, Wisconsin– the summer destination for pick-your-own fruits and a great cherry getaway. Time to head to the country to pick up a few buckets of delicious Montmorency Cherries. Door County is a veritable “cherry bomb” – with dishes and activities throughout the region focusing on the county’s main crop (Door County is expected to produce more than 8.5 million pounds of cherries each year). U-Pick operations should remain open through the middle of August. What’s so good about cherries—besides their sweet-tart taste? 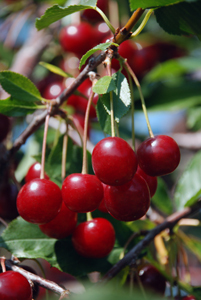 Scientific research reveals that tart cherries have high levels of disease-fighting antioxidants. Emerging evidence indicates that cherry consumption may ease the pain of arthritis and gout, as well as reduce risk factors for heart disease, diabetes and certain cancers. Cherries also contain melatonin, which has been found to help regulate the body’s natural sleep patterns, aid with jet lag, prevent memory loss and delay the aging process. Start the day with Door County’s Cherry Stuffed French Toast at the White Gull Inn in Fish Creek. The fresh egg bread layered with Wisconsin cream cheese and Door County tart cherries, topped with genuine maple syrup was named “America’s Best Breakfast” by Good Morning America (www.whitegullinn.com). Visit more than a dozen orchards and farmers markets around the county where visitors can pick fresh cherries off the trees or fill a shopping basket with dried cherries, jams, jellies, pies and turnovers. Go to www.doorcounty.com for market locations, store information and a special orchards map. The 2018 summer season of Northern Sky theater includes premiers of two new musicals next summer and o a new twist on one of the all-time favorite shows. www.folkloretheatre.com. Located just 40 miles northeast of Green Bay, Wisconsin, the 70-mile long peninsula of Door County is situated perfectly between the waters of Green Bay (to the west) and Lake Michigan (to the east) giving visitors a variety of experiences on two distinctive coasts with charming towns in between. Door County features 300 miles of shoreline, 34 islands, 11 lighthouses, 5 state parks and 19 county parks. It is known for its natural beauty, artistic offerings and outdoor recreation opportunities. Good stuff! Cherry season in WI is very special. Let us know if you're interested in learning about other unique WI foods.